Start off your visit on the 14th (Fri): step off the mainland to explore Magnetic Island Forts Walk. Get ready for a full day of sightseeing on the next day: choose your vessel at Pilgrim Sailing and then choose your vessel at Big Mama Sailing. To find reviews, photos, other places to visit, and more tourist information, read our Magnetic Island trip builder website . Melbourne to Magnetic Island is an approximately 6.5-hour combination of flight and ferry. You can also do a combination of car and ferry; or do a combination of bus and ferry. When traveling from Melbourne in December, plan for a bit warmer days in Magnetic Island, with highs around 37°C, while nights are much hotter with lows around 28°C. Wrap up your sightseeing on the 16th (Sun) to allow time to travel to Cape Tribulation. You'll discover tucked-away gems like Daintree Rainforest - Cooper Creek Wilderness and Myall Beach. You'll get in some beach time at Cow Bay Beach and Thornton Beach. Explore the numerous day-trip ideas around Cape Tribulation: Bloomfield Waterfall (in Bloomfield), Tranquility Falls (in Daintree) and Grassy Hill (in Cooktown). Spend the 17th (Mon) exploring nature at Daintree National Park. Next up on the itinerary: admire the sheer force of Alexandra Bay Waterfall. To find maps, ratings, where to stay, and other tourist information, read our Cape Tribulation visit app . Getting from Magnetic Island to Cape Tribulation by combination of ferry and bus takes about 9.5 hours. Other options: do a combination of ferry and car; or do a combination of ferry and bus. In December, daily temperatures in Cape Tribulation can reach 36°C, while at night they dip to 26°C. Finish up your sightseeing early on the 20th (Thu) so you can catcht the bus to Cairns. Explore hidden gems such as Atherton Tablelands and Trinity Beach. Take a break from the city and head to River Rafting & Tubing and Australian Butterfly Sanctuary. Spend the 22nd (Sat) wandering through the wild on a nature and wildlife tour. There's much more to do: take in the dramatic scenery at Josephine Falls, pause for some serene contemplation at St Monica's Cathedral, soar above the sights with a balloon tour, and let little ones run wild at Muddy's Playground. Discover how to plan a Cairns trip in just a few steps with Inspirock's itinerary builder. Getting from Cape Tribulation to Cairns by bus takes about 3.5 hours. Other options: drive. December in Cairns sees daily highs of 36°C and lows of 26°C at night. Wrap up your sightseeing on the 25th (Tue) early enough to travel to Mooloolaba. Kick off your visit on the 26th (Wed): visit a coastal fixture at Caloundra Lighthouses, then tour the pleasant surroundings at Kings Beach, and then kick back and relax at Peregian Beach. On the 27th (Thu), you'll have a packed day of sightseeing: kick back and relax at Mooloolaba Beach and then discover the deep blue sea with a scuba or snorkeling tour. To find reviews, other places to visit, traveler tips, and tourist information, refer to the Mooloolaba trip planner . Traveling by combination of flight and bus from Cairns to Mooloolaba takes 5.5 hours. Alternatively, you can drive; or take a train. Traveling from Cairns in December, expect Mooloolaba to be little chillier, temps between 32°C and 23°C. 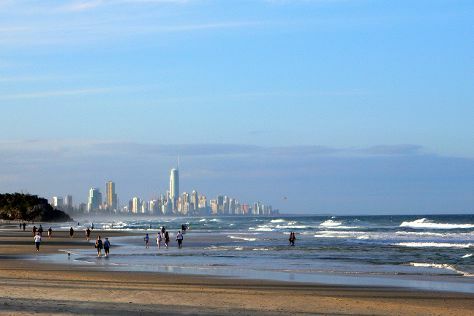 Finish up your sightseeing early on the 27th (Thu) so you can go by car to Gold Coast. You'll discover tucked-away gems like Burleigh Head National Park and Natural Bridge. 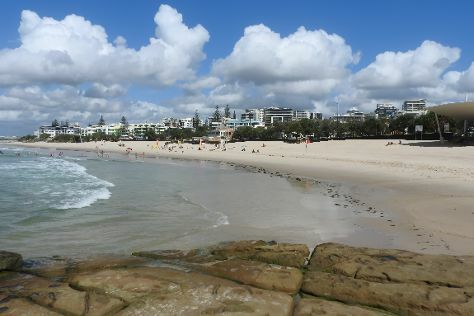 You'll enjoy a bit of beach vacationing at Kirra Beach and Coolangatta Beach. There's lots more to do: kick back and relax at Greenmount Beach, enjoy breathtaking views from SkyPoint Climb, tour the pleasant surroundings at Kurrawa Beach, and browse the different shops at Robina Town Shopping Centre. To see ratings, reviews, more things to do, and more tourist information, refer to the Gold Coast journey planning app . You can drive from Mooloolaba to Gold Coast in 2 hours. Other options are to take a bus; or do a combination of bus and train. Expect a daytime high around 32°C in December, and nighttime lows around 22°C. Finish up your sightseeing early on the 31st (Mon) so you can travel back home.